I didn’t think I would ever see the day where I’d sit down and watch all six movie of The Fast and the Furious collection. I knew it wasn’t really my thing, but hey…people ranted and raved about them, and considering Paul Walker’s unfortunate death that came too soon, I had to watch them. While I saw the first film yesterday, I can’t believe it, but today, I watched 2-6. It’s not that I love them, it’s that I genuinely enjoy them for the most part. Fast Five, for example, was really great. Fast & Furious 6, or Furious 6 to others, was almost as great as its predecessor, but not quite. Alright, so with their riches that they stole in the previous film, the gang has retired from their former life and reside in a country that won’t arrest them. However, Officer Hobbs is currently investigating a case about other professional drivers with a lot of pull with people all over the world. In order to stop him, Hobbs needs the help of Dom and his team, and to persuade him, he shows Dom a recent photograph of what appears to be a very alive Letty. Reluctant, Dom agrees under the terms that his entire team gets pardons. There are reasons I really like this film as well as the opposite. 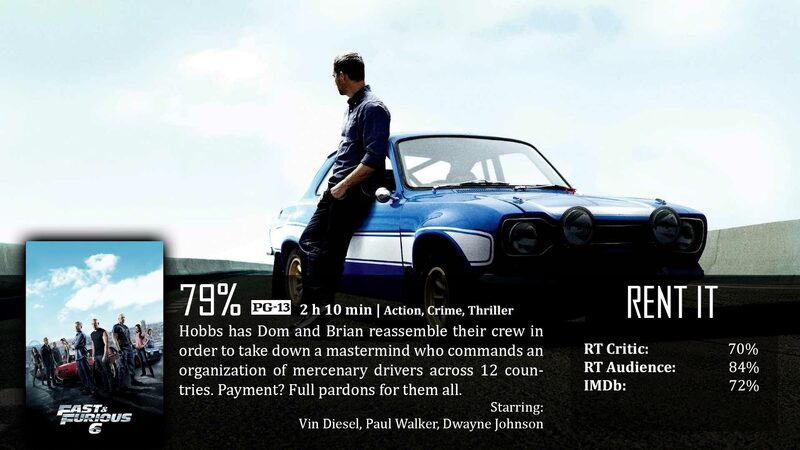 The reasons I actually like this film is because it fits right in with Fast Five as a direct sequel. I don’t think any of the sequels have felt so right together as these two did. It’s almost like the series never knew what it was truly going for until now, but I’m not going to complain. They figured something important out. I like it because once again, they pulled together the same crew, the same actors for a story that is again – so appropriate for the series that it makes you wonder how it took them so long to get on point. That – I like. I wasn’t so much a fan of them bringing back Letty. Okay, it’s cool to have Michelle Rodriguez back, but if you have ever seen the show Prison Break, you would know that this movie did the same thing as the show – it brought back a character from death that should have remained dead for good reason. The only reason they brought her back was because it was a popularity contest. She’s an amazing actress, it’s true, and that’s why she’s back. No way did any of the writers expect this to happen, so they had to pull together some strange explanation…and it ruins a lot of the emotion and story progression that was created for the fourth film…ever notice how people kind of look past that film as if it didn’t happen? It’s not that bad of a movie, but this film disqualifies it completely – and it was the spoiler I heard about before I watched the fourth film. Which ultimately made it worse. The whole cast together can never be a bad thing, because together they can move mountains with their chemistry. It was also good to see a transition from this film to Tokyo Drift. The action sequences and visuals were definitely amped up. The story was great, but I didn’t connect with it as much as I did the fifth film. Maybe that’s because it didn’t have that element of F&F versus Oceans 11. If you’re like me, you will prefer the fifth one over this one. That’s not to say this one doesn’t come as a close second.